ColorBox and Red Show in A are the latest works to emerge from Jean Pierre Muller’s innovative 7×7 project. 7×7 is an inter-disciplinary collaboration between Belgian artist Muller and seven musical luminaries from a variety of contemporary genres; Robert Wyatt, Archie Shepp, Nile Rodgers, Terry Riley, Sean O’Hagan, Mulatu Astatke, and Kassin. 7×7 is based on the simple principle that the seven colors of the rainbow correspond to the seven notes of the scale, the seven days of the week (and deities and planets associated with those days) and the seven chakras. Seven sound altarpieces have been created, in an edition of seven, each housing an original music by one of the seven composers. A is Red is Monday, Day of the Moon and of Diana (Robert Wyatt), B is Orange is Tuesday, Day of Mars (Archie Shepp), and so on. A year later, Jean Pierre Muller and Nile Rodgers created An Indigo Night in F at the same venue, an amazing show combining music, live painting and theatre. 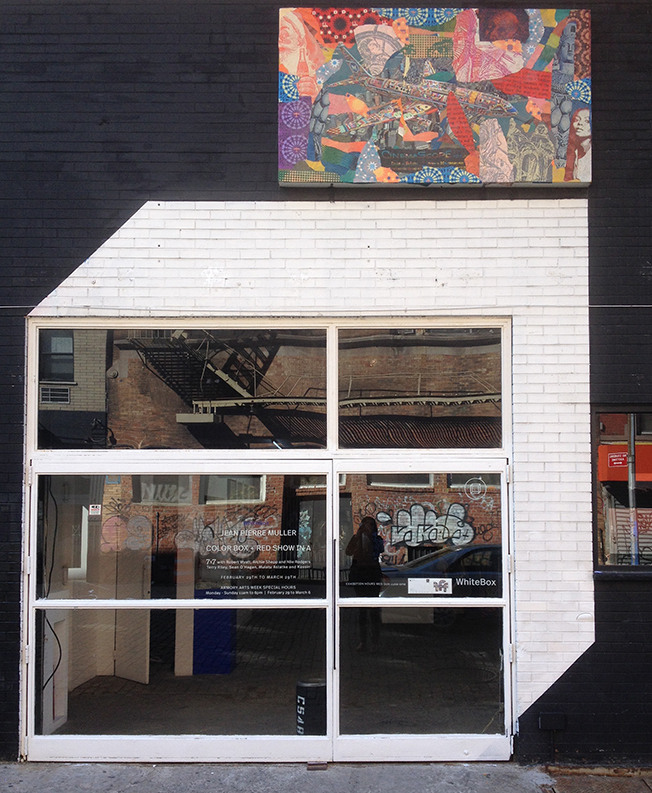 This acclaimed event was inspired by their collaboration on the 7×7-F-Indigo sound altarpiece. 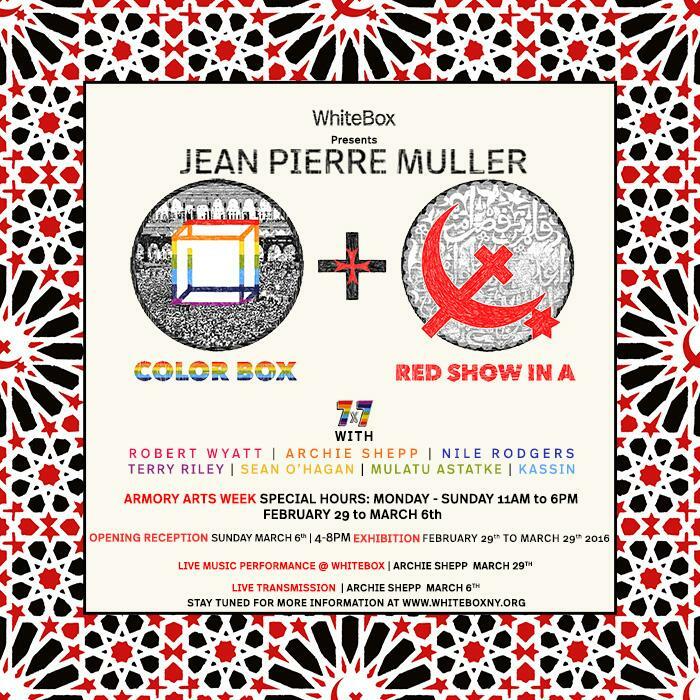 For WhiteBox, Jean Pierre Muller will present two original shows related to 7×7: Spectrum on the main level and A Red show in A on the lower level. Isaac Newton divided his color wheel in seven parts: red, orange, yellow, green, blue, indigo and violet. White is in the central part of the diagram, because all colors of light mixed together produce white. 7×7 at WhiteBox makes complete sense. How can we embrace diversity in a world torn by the conflict between standardization and obsession for identity? Muller wishes to pen the color box and celebrate the full spectrum of our lives in their many contradictions. Rather than taking the stance of the artist as a moralist, he embarks us on a journey through the seas of complexity and the skies of hybridity. Sometimes taking a sound panoramic view on things – drawing lessons from past history, digging into the origins of words, the meaning of symbols – sometimes zooming into our most intimate obsessions, Muller utters a multi-layered cry for life, plural yet deeply personal. As much a painter as a printmaker, Jean Pierre Muller also uses light, sound and interactivity to make us feel the beat of the world, the rhythm of life. The elements that Jean Pierre uses in his art reflect processes of urban evolution and the way people become connected to each other through common experiences and references. Like streets grown organically over time, these elements interact through juxtaposition and ever increasing layers of complexity and history. They also tell many intertwined stories, much like the intertwined stories of people in a street, who may not know each other but are linked through commonality of space and time. For WhiteBox, the artist has built his own Alhambra, a red temple to house the 7×7-Red-A sound altarpiece, with meaningful columns and whispering walls (with voices by Robert Wyatt, but also Terry Riley, Archie Shepp and Nile Rodgers). Muller has adapted Kazimir Malevich’s emblematic paintings of the Black Square, the Black Circle and the Black Cross into a Red Star of David, a Red Crescent and a Red Cross. These are powerful symbols to initiate a new reflection on hybridity, coexistence, expulsion… and the power of symbols. Following on from the success of 7x7th Street and An Indigo Night in F with Nile Rodgers, Spectrum and A Red Show in A represent the next stage in a truly international project of ever-growing artistic ambition and cultural resonance. 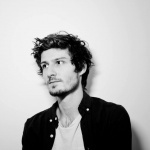 Jean Pierre Muller is a Belgian Neo-pop artist who makes vibrant assemblages using high and low forms and techniques. In his work, photography, drawing, silk-screen and painting come together and gestural and mechanical interventions meet. His collaborations with musicians offer an interactivity to his paintings, giving his audience new participatory ways of entering his world. Jean Pierre is committed to both his art practice and his role as head of the Printmaking Department at La Cambre, one of Belgium’s leading schools of art and design. His work has been shown at the Museum of Contemporary Art in Saragossa, the Hanover World Fair, the Royal Festival Hall and, latterly, Summerhall as part of the Edinburgh Festival.